Twinflower Linnaea borealis, is a rare flower of Caledonian woodlands. Most if not all the twinflower surviving in the northern Highlands (north of the Monadliath massive) exist as single clones. Roughly only 16 clones are surviving today, many of which are just clinging on. These clones do not produce seed because they need another individual nearby to do this. Due to habitat fragmentation these individual clones are too far from each other to reproduce sexually. Here at Aigas we are part of the North Highland Twinflower Conservation Project, which is working towards establishing self-sustaining twinflower populations across the northern Highlands. We are the first location to have a new viable populations of twinflower planted as part of this project. Segments of multiple clones have been collected then planted close to each other at multiple sites around Aigas. 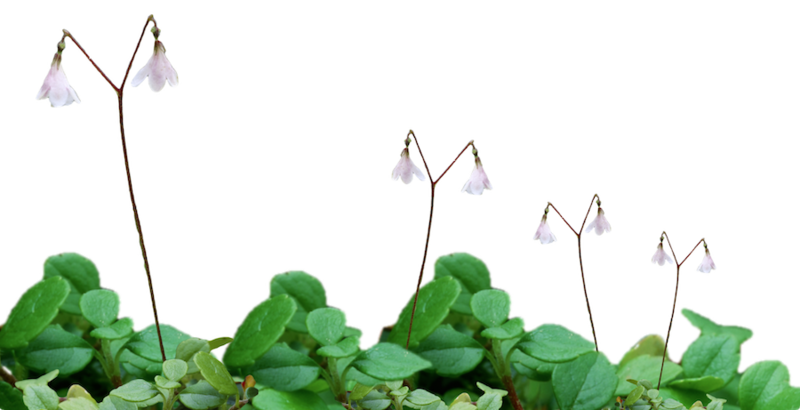 Over the next few years we expect the twinflower to spread through our scots pine woodland and begin to set seed producing a new genetically diverse population which will be more resilient to disease and change in climate. The twinflower will add a missing component to our native scots pine woodland and will join an array of flora under the canopy of the scots pine woodland which includes creeping lady’s-tresses, Goodyera repens and the lesser twayblade, Listera cordata amongst others.